The Miniature Pinscher (sometimes called the "King of Toys") originated in Germany and was known as a zwergpinscher. Historical artifacts and paintings indicate that the Min Pin is a very old breed, but factual documentation begins less than 200 years ago, which leaves the breed's actual origins open to debate. The breed's earliest ancestors may have been a mix of Italian greyhounds, dachshunds and the shorthaired German Pinscher. "Pinscher" means "Terrier" in German, they were bred on farms to keep the rats from the store rooms - being small, they could get into the places where rats took refuge. Some have the black and rust coloring, cropped ears, and docked tail, and for these reasons they resemble a miniature Doberman - most likely because both the Miniature Pinscher and the Doberman both were developed from the German Pinscher. In truth the Min Pin is a separate, and much older breed. The Miniature Pinscher is a well balanced, sturdy, compact, short-coupled, smooth-coated dog. The short, smooth, hard coat lies close to the body and colours include black with rust markings, chocolate with tan, red and stag red (red with black hairs). The Miniature Pinscher will adapt to any living arrangement from a farm to an apartment, they are very active indoors and will do okay without a yard. However due to their short coats they get cold easily so care must be taken in cold weather. They make ideal companions to almost anyone from singles to families to the elderly. Min Pins are extremely curious, they will investigate everything and, if they are not watched closely, can get themselves into trouble. It is similar to living with a toddler who needs constant supervision and when you aren't supervising, they should be securely tucked away in a crate (crate training is highly recommended). Because of their terrier side they will hunt down small objects (keys, coins, kids' toys, and so forth) and chew them, which can lead to them choking. Medication can be a serious issue, because the Min Pin will find and ingest any pills that accidently drop to the floor. By giving them save toys and activities you can manage this by satisfying their inquisitive side. It is also very important to go over your yard and fencing with a fine-toothed comb, look for and fix any hole or opening (if your hand can fit through it, so can your Min Pin). Make sure all doors and windows, and their screens, are sturdy and secure as well. They are escape artists of note (they are known as the "Houdini of the dog world"), they will find a weak places in the fencing or dash out the front door while you sign for a package. You have to be on your guard to keep this breed safe. This breed is deeply loyal, protective, alert and wary of strangers; this makes then excellent watchdogs. They will bark loudly at anything that seems to present a danger, and will take a challenging stance to face it. However, if left unchecked some can develop a tendency to bark too much at times, but with training this can be controlled. The Min Pin has endless, non-stop energy - you will never find them lounging about. Because of this they need lots of exercise both inside and outside the home. Play will take care of a lot of their exercise needs, they love to chase, play with and chew things. But they need daily walks; on leash to prevent them from chasing after small animals or thing that moves. They will also enjoy a good romp in a safe, open area off lead, such as a large, fenced-in yard. Make sure any yard in which they can run loose has a fence high enough to prevent their determined efforts to escape and explore. Another way of exercising them both physically as well as mentally is to take part in competitive obedience and agility. The Min Pin needs early socialization as puppies to ensure that they grow up to be well-rounded dogs. Like any dog, they can become timid or quarrelsome if not properly socialized. Like a lot of small breeds the Min Pin is prone to developing Small Dog Syndrome, this is where the dog believes that they are boss and is due to the fact that the owner is too lenient with them and lets them get away with more that they should because they are so small and cute. This can lead to the dog becoming demanding, headstrong, protective, aggressive towards other dogs, suspicious of strangers and bark excessively. To prevent this you need to give this dog rules, and limits to what they are and are not allowed to do; be firm and consistent. This breed is not a good choice for first-time dog owners or even if you're an experienced dog owner but you're new to the breed. Their energy and intelligence can catch their owner off guard and without proper training and supervision, they can quickly become a tyrant in the household. While you certainly don't want to rule with an iron fist, you must establish firm leadership. If well trained and socialized they are affectionate and loving dogs that love to entertain, and will often play the class clown in order to get the attention they want. Which other breeds are most compatible with the Miniature Pinscher? The best breed to get with a Min Pin would be a smaller breed so they are about the same size, you can look at breeds like Chihuahua, Maltese, Shih Tzu, Pekingese, Pomeranian, Whippet, another Min Pim (of course), etc. If you are looking for a bigger dog it is best to get a calmer, easy-going breed as larger more playful dogs can accidently hurt the Min Pin. Look at breeds like a Gray Hound, Great Dane, Labrador (once they calm down after their boisterous teen years), Wolfhound, Saint Bernard, etc. The level at which these dogs get along with other animals depends greatly on how well they were socialized as pups, they are naturally cautious and can be aggressive towards other dogs but with proper socialization they can get along great with other dogs and even cats (as long as the cat doesn’t run away - to which the dog will chase). However because they were originally bred to hunt vermin, they are not well suited to homes with small mammals (rats, rabbits, etc) as they may perceives them as prey to chase and kill. Miniature Pinschers will adore children and make a trustworthy companion if they are treated carefully and kindly. However, if children grab or treat them roughly, even accidentally, they will defend themselves by biting. For this reason they are best suited for older children who will understand to handle them correctly. Never leave then unsupervised with toddlers or young children. They tend to be distant and aloof with strangers, and generally not very friendly to people outside their family. They can be independent and defensive, and will nip at both children and adults if they feel uncomfortable or threatened. Min Pins are relatively easy to train, they love learning and seem to understand and obey commands very quickly. They don’t do well with aggressive/rough training (they will nip); training should be persistent, positive, and gentle. However, they do need a firm hand and if you are at all unsure it is best to work with a trainer who has experience teaching these vivacious dogs. They can be quite difficult to housebreak, greatly because their puddles are so small it can easily be overlooked and the dog may get the idea that you are happy to accept it fulfilling its natural needs indoors. Crate training is very important and highly recommended for your own sanity as well as your dogs safety. When you can’t supervise them, they can be securely tucked away in a crate. This will also help with house training them. Miniature Pinschers are fairly easy to groom, since they keep themselves neat and don’t shed a lot. They only need brushing every few days to keep their sleek coat shiny. Frequent bathing is not recommended because it dries the skin, instead simply wet a washcloth with warm water and wipe the coat down. Other grooming requirements include brushing their teeth at least two or three times a week to remove tartar buildup and the bacteria that lurk inside it and to trim their nails once or twice a month if your dog doesn't wear them down naturally. Legg-Calve-Perthes Disease: This malady involves the hip joint, and many toy breeds are prone. If your Miniature Pinscher has Legg-Perthes, the blood supply to the head of the femur (the large rear leg bone) is decreased, and the head of the femur that connects to the pelvis begins to disintegrate. The first symptoms, limping and atrophy of the leg muscle, usually occur when puppies are four to six months old. Surgery can correct the condition, usually resulting in a pain-free puppy. Some other conditions that can occur are obesity, hip dysplasia, elbow dysplasia and von Willebrand's disease. In Germany (their country of origin), they are called Zwergpinscher. 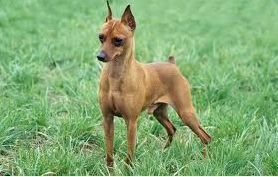 “Pinscher” refers to dogs who were bred as guardians or to hunt vermin, and “zwerg” means "dwarf" or "midget." Miniature Pinschers have a distinctive gait called the "hackney gait," much like the horses. Crate train your Min Pin for those time that you can’t supervise them. Leave them unsupervised with toddlers, they can be easily injured by roughhousing and this can cause them to become nippy. Allow them to take over the household, you need to be firm and let them know their place.